Please Note: On right picture above, for comparison (left) shorter .41 Special vs. (right) longer 41 Remington Magnum. One Cartridge, Not a Box ! .41 Special, new production by PCI using new brass cases from Starline Brass with “*∩ * 41 SPL” Head-Stamp and 225 grain Lead projectile. Sold as a collectible, due to age may not fire. 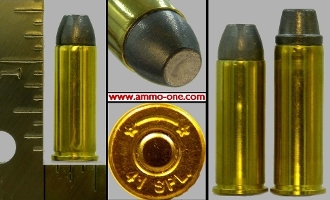 Most cartridge collectors and shooters are familiar with the .38 Special vs the .357 Magnum or the .44 Magnum vs the .44 Special. The .38 & .44 Specials have a shorter case and are a less powerful version of the .38 and .44 Magnums; however, the Specials can be shot in the Magnum firearms and deliver less recoil. The .41 Remington Magnum (a/k/a .41 Smith & Wesson Magnum) was introduced in 1964, and a few wildcat loaders made their own .41 specials by reducing the .41 Magnum case to 1.16" in length, or the same length as the .38 Special and .44 Special cases. Colt also considered and tested a .41 Special in the early 1930s, however they never commercially produced the cartridge. Not until 2017 did cases become available from Starline Brass Company.